Designed for testing equipment under load, REO UK Limited has introduced a new variable resistor load bank with fixed stages connected in parallel and switched in, as required, with an adjustable stage for fine trimming. 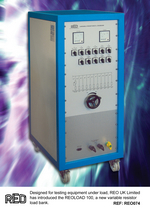 The REOLOAD 100 series will find applications in the testing of power supplies, generators, motor/alternators and rectifier sets. It is also ideal for testing lifts and cranes. The units are constructed in an IP10 enclosure and designed to accept standard 19” racking. The approximate dimensions are 600mm wide x 800mm deep x 1125mm high. Castors are fitted to provide manoeuvrability and these can be locked once the unit is in position. The REOLOAD 100 will operate in a maximum ambient temperature of 40°C and mesh over the top and in the bottom of the unit allows good circulation of cooling air, which is fan assisted. A 230V supply is required to drive the fans. Laboratory terminals are provided for connecting to the equipment under test and fitted in the front panel are two 96 x 96 Class 1.5% panel meters for displaying true RMS voltage and current.